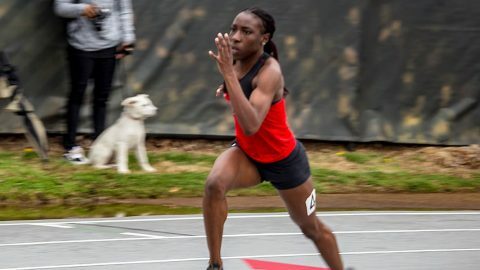 Nashville, TN – Austin Peay State University track and field was able to find several silver linings in all the clouds above Vanderbilt Track and Field Complex, overcoming the dreary conditions at the Vanderbilt Black and Gold for a solid weekend in Music City. Sophomore Tymeitha Tolbert had a productive two days; the Louisville native put together a personal-best in the 200m, Friday, placing ninth with a 25.09 mark—which should put her comfortably inside the top-eight in the Ohio Valley Conference best lists—and backed that up on Saturday with an 11.90 in the 100m. Her 100m showing, which earned her fourth in the event, is tops in the league based on results entering the week. Junior Savannah Amato increased her lead in the OVC pole vault race, posting a 3.85m (12-7.50) mark to take runner-up honors. Junior Dascha Hix (3.70m; 12-1.50) and freshman Morgan Bradley (3.55m; 11-7.75) tied for third and eighth, respectively, with Hix’s mark a season-best and Bradley’s her career-high in outdoor action. A pair of freshmen proved they could compete with some of the best in the south with Saturday’s outings. In the 400m, OVC-leading Sabrina Richman placed sixth overall with 56.82 mark, while Denia Hill-Tate‘s 14.75 in the 100m hurdles brought her seventh at Vanderbilt. Richman and sophomore Amelia Thiesing won the second and third heats, respectively, of the 400m, with Thiesing’s 58.45 jaunt placing her ninth in the 25-runner field. Both relays were impressive for the Governors on Saturday. In the 4x100m, a quartet of Tolbert, Maya Perry-Grimes, Diamond Battle and Allysha Scott breezed around the track at 47.89, giving them the top spot in the league and fourth on the day, while Scott, Thiesing, Richman and Allana Johnson became just the second team in the OVC to post a sub-four minute 4x400m mark, finishing fourth at 3:55.71. The squad will split next week, with some athletes heading to Gainesville for the Florida Relays and some slated for a venture to Cape Girardeau, Missouri for the Joey Haines Invitational.